Safari Adblock – Similar to the adblock in Google chrome, the same team has built the ad blocker extension for Safari. The entire ad script is blocked by safari, and the ads are not at all downloaded when this extension is installed. You can download it from here. Goo.gl shortener – You don’t need to shorten any long URL by visiting the shortener website. 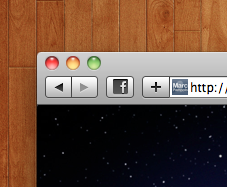 Instead the extension helps you shorten the URL of the page you are browsing, just in a single click. Download it here. Reddit comments – Takes you to the reddit comments for the current page. If the page hasn’t been submitted to reddit, it takes you to the submission page and fills out the details for you. Download from here. Download from Youtube – Dropdown allows you to download videos, after the video page opens in Youtube. Easy options for downloading videos from Youtube in Safari browser. Download from here. 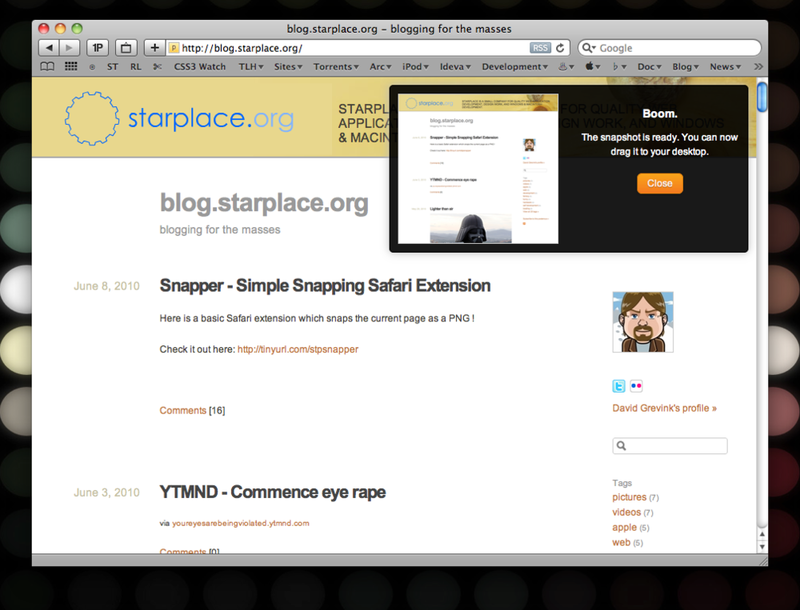 Snapper – This extension helps in capturing the screenshot of the web page you currently are on, and save the image as PNG file. Download it from here. Linked images – Searches through the current page for links to images, then embeds the actual image in place of the link. Doesn’t seem to work on pages with more than about 150 linked images. Download from here. Invisible status bar – Save display space or appeal to your own sense of minimalism by hiding Safari’s native status bar, and using the Invisible Status Bar instead. Only shows up when you hover over a link, i.e. when you need a status bar. Download from here. 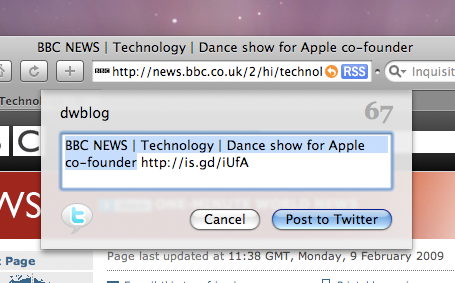 safari140 – Twitter extension for Safari, which allows you to tweet from within the browser. Auto-shortening of the long URLs and auto-filling with the current URL in the tweet. Download from here. Type-To-Navigate – Keep your hands on the keyboard while browsing the web. Type any text that occurs inside a link, and hit return to follow it. ?G jumps to the next link containing the text, and ? ?G jumps to the previous. Hit ESC to cancel or exit a focused field. Download from here. Share with Facebook – Places an icon of Facebook right beside the address bar, and lets you share the website you are browsing, with a single click. Download from here. Gmail Checker – The Gmail Checker extension will give you an icon and badge in your Safari toolbar to show unread messages on your Gmail account. Google apps users still can’t use this, but soon a newer version will help with it. Download from here. Search Preview – This extension puts preview thumbnails of the websites just beside the search results in the Google, Yahoo and Bing search engines. Download from here. Reload Button Bring it back! Amazon Search Bar Search bar for Amazon. Please comment with more interesting extensions, to add to the list. This is not a particularly helpful article/post. The links directly download the extensions – no reference to the creator’s web pages etc. so you could find out more information about them before downloading them (or after). Plus, at least one doesn’t work at all… the goo.gl shortener extension installs but does nothing. Further, there are no instructions or how to use provided here, and with the goo.gl extension nothing is obvious except a G in the toolbar that when pressed does nothing. And because there is no reference to the original Web site of the creator, there is no place to go for help (I figured it out eventually but it wasn’t helpful either). So in the end I uninstalled it. Stick with the links provided at http://extensions.apple.com/ They are helpful, they work, nuff said. 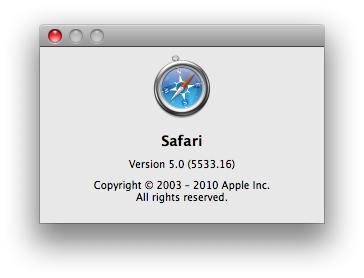 – Currently the safari extension system does not allow snapshots of the whole page, only the current viewport. I am looking into solutions, but no solution yet.